Just 15 years after WWII, life was good. As the world rebuilt itself, prosperity reigned. Returning soldiers who needed an outlet to keep their competitive edge found what they were looking for in gambling. Neighborhood poker games, back-alley craps, and illegal casinos were everywhere if you knew where to look. Grifters followed the money trail, too, and not all of them relied on skill. Many used devices such as holdouts, shiners, gaffed cards and crooked dice to ensure that they fleeced the lambs just as surely as if the marks openly handed their cash to the swindler. 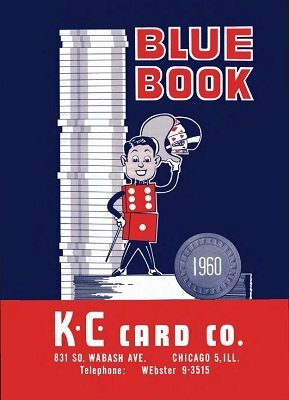 Catering to the demand for crooked gambling paraphernalia was the K.C. Card Co. of Chicago. Their handsome, two-color catalogs are jealously hoarded by collectors today. This wish book of bookies and cheats is lavishly illustrated with photos and line drawings of gaffed dice, cards, casino equipment, inks, daub, and much more. If you perform with cards, collect gaming paraphernalia, or simply want to be in the know about crooked gaming devices, you'll want to add this informative, historical reprint to your digital library. Edited by B.W. McCarron, author of The Gambling Magician . 1st edition 1960, 80 pages.